For those who were looking forward to get the latest updates on the rare Emerald Iceberg, it is here. Antarctica has bunches of unexpected things that attracts numerous researchers and traveler, globally. Indeed, there must be more secrets these white-blue icebergs can be hiding within themselves. Maybe, someday we shall figure out all of them. 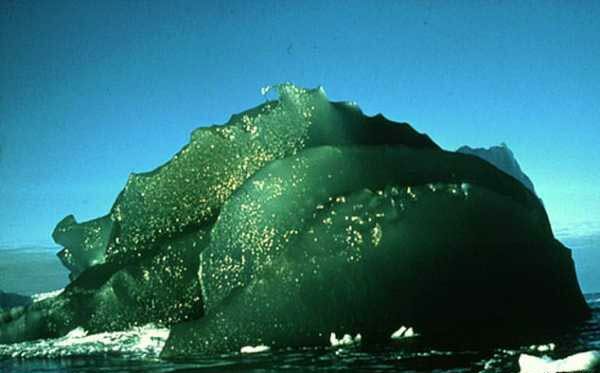 That said, the bottle green icebergs in Antarctica are trendy for its rare site and occurrence. Many years ago, captain of a Ship traveled through the Antarctic waters and saw the rare green icebergs. It was then, glaciologist Dr. Stephen Warren from the University of Washington, climbed on one of the green monolithic during an Australian expedition in 1998. Originally, icebergs are formed with the help of snow. The snow has some air present that gets converted into bubbles. This is the reason why icebergs are cloudy and bright while glacier ice contains numerous bubbles. Dr. Warren was intrigued by the clarity of the green iceberg with no bubbles. Strangely, emerald ice has no bubbles which make it not ordinary and rare. To which, Warren took a sample from East Antarctica’s Amery Ice Shelf and compared with other green ice samples. His research found the clear jade coloration was not due to glacier ice but due to marine ice. Most icebergs in Antarctica are blue or white and some are striped. But green iceberg is rarest and uncommon. Warren’s team at first thought the possibilities of impurity in the ocean water. Perhaps, maybe due to microscopic particles of dead marine animals and plants that caused the formation of green ice. But the thought was proved wrong when the researchers found a similar amount of organic materials in blue and green icebergs. If not dead marine plants or animals, then how it is possible? You must be having that thought yet again! What Causes Iceberg Turning Green? It was an oceanographer, Laura Herraiz-Borreguero’s research at the University of Tasmania that inspired Warren. The study found Amery Ice Shelf core had almost 500 times more iron than any glacial ice in Antarctica. But how it is possible to iron oxides are turning these blue hues into dark green? Where did so much iron come from? The iron-rich particles flow into the ocean and get under ice shelves to mingle with marine ice. The frozen seawater contains dissolved organic matters like Phytoplankton and Algae. These two can be the reason for giving a yellow-ish tone at the bottom of the ice shelf, which already has a blue-ish tint. The freshwater ice shelves are very thick. The yellow underside cannot be visible unless the iceberg capsizes or breaks off. When one of the ice shelves breaks and falls upside down, the frozen yellow-tint gets visible. So, the yellow tint on the top of the sea and blue beneath the water gives a visual mix. Dr. Warren then compared the oxygen isotope ratios of green iceberg’s upper and lower portion. The analysis found oxygen isotope ratios characteristics of seawater in the yellow upper part. The similar analysis on the blue showed lower portion to be fresh water. The in-depth analysis of each portion showed dissolved marine plants in the frozen sea water as evidence. The analysis indicated the higher concentrations of marine life in the Antarctic region for centuries, according to Dr. Warren. According to Warren, there can be 1 in 1,000 icebergs sighted green in Antarctica. The lower temperature of Antarctica does not allow large ice shelf to melt. Instead, the seawater freezes to the ice shelf. Now you know the mystery behind Emerald Iceberg. But, there is still no fixed evidence that this green ice formation is due to iron or dead marine animals and plants. Iron is an essential nutrient for Phytoplankton, a microscopic plant and is used as a marine food. If in the coming years, the research proves green icebergs contains precious iron from Antarctica, then it can support nearly all marine life. How? When the green iceberg breaks into the open sea and melts, the phytoplankton present can be used as a nutrient. It is like taking a package to the post office. So, if the experiment proves green icebergs to be very important then it can be a huge success.